When I find interesting or shocking news stories, I love to share them with my students. Focusing on the vocabulary in the story is one thing, but when there's a lesson, a theme, or an emotional reaction that a particular news story creates, there's a tremendous opportunity for ESL learners to remember and relate personal or shared experiences to what they are reading and comprehending. 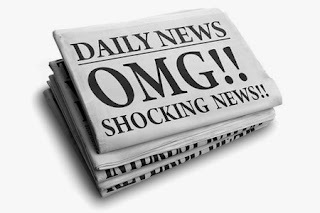 News stories that are interesting, compelling, touching, shocking, humorous or just plain unbelievable can make learning and remembering new and tricky vocabulary and expressions painless and can help spark students' interest in talking about them! Read more on teaching tips and some of the news stories this year that have made me go WOW here! October Topic: Halloween, Superstitions and Fear!